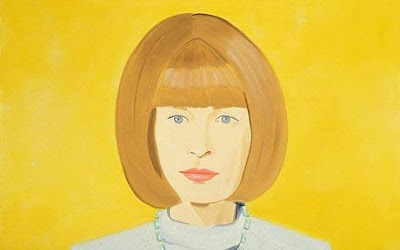 The portrait of Anna Wintour by American artist Alex Katz can be seen as simple yet very complex. Anna Wintour is obviously the main and only subject of the painting. Anna is set against a bright background, which can only be described as mustard yellow. Anna sits in the center of the painting facing directly at the artist. Her shoulders are square and her posture seems precise. The painting begins right below Anna’s shoulders. Anna is wearing a light lavender turtleneck. The artist used shadowing around the collar of the turtleneck to show the folds. A necklace dangles around Anna’s neck. The necklace has small turquoise rectangles that appear to be linked together by nothing yet they are still attached. Katz painted Anna’s skin a light, creamy color. He uses slight shadowing on her neck under her chin. Anna’s nose is small and almost blends with the rest of her face if it wasn’t for the shadowing of the nostrils. The quietness of Anna’s nose makes her others features stand out even more. Her lips are about average size. They are full but not big and they have a nice subtle red color. Anna has a striking purplish blue eye color. The boldness of the eyes makes them the focal point of the painting. The emotion portrayed in her eyes is not harsh, as one would expect from the Editor-in-Chief of the major magazine, American Vogue. Anna appears to be calm and serene and that is only seen through her eyes. The white of her eyes is not a bright white but a creamy color like her skin. Katz painted a thin line of black eyeliner on her upper eyelid that frames her eyes. Above her eyes, partially seen, are her light brown eyebrows. They are pretty much covered by her bangs that completely shield her forehead. Anna’s hair is in the style of a bob that frames her face. Her hair looks delicate and soft through the artist’s long, fluid brushstrokes. Her bob is a light brown color with few highlights and lowlights. All together Katz painted a beautiful and serene portrait of Anna Wintour.